Air Burners is pleased to introduce a new product we call the PGFireBox®. The PGFireBox is a revolutionary patented machine for generating biomass energy. The problem with today's biomass energy systems is they are very selective about their waste – in fact, only about 80% of typical biomass waste is acceptable to most of today’s systems. Plus, these systems require significant preprocessing, sorting, grinding, and chipping as well as a secondary fuel source, like natural gas, to support combustion. All of this raises costs and has a negative impact on the environment. The PGFireBox eliminates all this preprocessing and the need for secondary fuel. The particulate emissions are controlled and the waste is allowed to burn naturally, which makes it a truly carbon neutral system. Our PGFireBox systems come in three power ranges: 100kW, 500kW, and 1000kW (1 Mega Watt). The other significant feature of the PGFireBox is that it is portable. All our systems can be relocated, as they do not need any permanent structures. Our systems actually eliminate the waste (98% mass reduction), leaving only a highly desirable carbon ash and carbon biochar for recycling. For over 20 years, we have been shipping our wood and vegetative waste elimination systems around the world. The Air Burners FireBox is a fully self-contained and portable system that can be dragged up a pipeline, dropped on a logging road, or permanently located at a landfill. It is the fastest, safest, and most cost-effective land clearing equipment solution for eliminating wood and vegetative waste. Air Burners FireBoxes come in three frame sizes. S100 fits into an ocean-going container. S200 is the largest FireBox you can load on a truck without road permits. The S300 is the largest FireBox we can ship fully assembled. Most of the frame sizes also have options for different lengths. The FireBoxes remain completely assembled and ready for use. For more permanent installations, we offer all the frame sizes in an electric version. 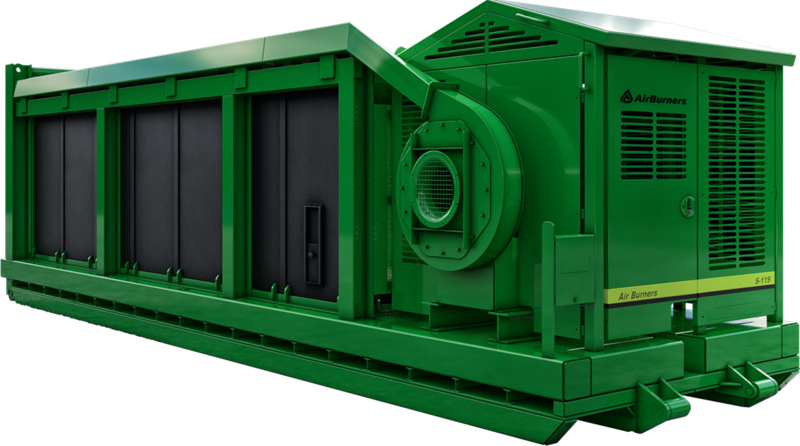 In this version of the product, the air curtain fan is powered by an electric motor connected to the power grid in lieu of an onboard diesel engine. The Roll-off FireBox is another patented design from Air Burners. This unit fits a standard cable hoist truck or hook lift truck. This helps with easy mobility and is an ideal piece of equipment for a company currently delivering roll-off dumpsters and waste skids. The BurnBoss® was designed primarily for forest and agricultural use. A trailer mounted FireBox hydraulically actuated to be raised and lowered, the unit is ideal to move around logging roads for forest fire prevention and post fire cleanup. Many city and county parks, as well as roads department crews, use the BurnBoss for cleanup work. The BurnBoss is also popular with homeowners’ associations and fire departments to provide a clean and safe facility for eliminating waste from defensible zones in the Wildland-Urban interface. The BurnBoss is ideal for vineyards and fruit or nut tree farms to eliminate seasonal trimmings and debris from crop rotation. The BurnBoss can be towed by pickup truck or tractor. The patented Air Burners Trench Burner sets the standard for the industry with its no assembly required easy set up. Our systems always include the very important carrier pipe. The carrier pipe provides an important 20-foot safety zone between the trench and the machine. None of the other machines on the market has a carrier pipe because it is much cheaper to design without it. As we are the oldest manufacturer of trench burners, we have the most experience protecting your investment from wind change or a non-attentive operator. Our Trench Burner is the finest towing machine on the market with perfectly balanced twin torsion axles giving you good ground clearance and great maneuverability. Our road-ready Trench Burners are typically towed with a pickup truck. Click here for more information about product pricing and financing options.